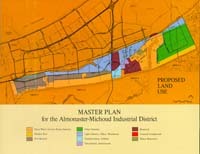 The Almonaster-Michoud Industrial District (A-MID) was created in 1979 by the Louisiana Legislature as an industrial park to attract business and industry into the City of New Orleans. It encompassed 7,000 acres in the area of Eastern New Orleans roughly bounded by the Industrial Canal, Chef Menteur Highway, the Maxent Canal, and the Gulf Intracoastal Waterway. Most of that area was then vacant, though a number of industries were in operation prior to the site's official designation. In 1995 the name was changed to the New Orleans Business and Industrial District. The rather unfortunate acronym attached to the new name--NOBID--was not exactly conducive to an increase in industrial or commercial activity, so in 2004 the area was restructured as the New Orleans Regional Business Park. This month's Gallery goes back twenty-five years to the early days of A-MID's development, using slides selected from some 1,500 that were transferred to the City Archives by the city's Office of Economic Development in 2002. They are aerial views of the A-MID area taken in 1981 and showing existing development (and the empty land surrounding those commercial and industrial uses). Off in the distance the photographs also show portions of the New Orleans East, Lower Ninth Ward, and St. Bernard Parish neighborhoods that were so tragically devastated by Hurricane Katrina and the associated flooding. The Business Park saw some flooding and had its share of wind damage but overall appears to have suffered less destruction than the rest of the East. As of early May about forty companies (out of 104, pre-Katrina) were back in business. The future of the others, though, is largely uncertain. The A-MID/NOBID/NORBP area will be rebuilding for many years along with the rest of the Crescent City.